The Oder Valley is connected to the international cycling path network by the Oder-Neisse cycling route. 160 kilometres of cycle paths cross it. Cycling tourists can combine active movement in the Lower Oder Valley National Park with an impressive natural experience in one of the last river moors still present in Central Europe. Through the Oder-Neisse cycling path, which goes along the western edge of the protected area, the Lower Oder Valley National Park is connected to the international cycling path network. 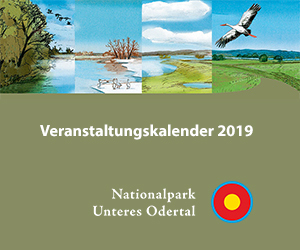 Through the Uckermark circular cycle way, which crosses the Oder-Neisse cycling path in Schwedt and Stolpe in the Lower Oder Valley National Park, the Oder Valley is also connected to the cycle path network of the Uckermark. Cycling tourists can also take trips to the National Natural Landscapes Biosphere Reserve at Schorfheide-Chorin and Uckermark Lakes Nature Park. Additionally, the Uckermark circular cycle way represents a cross-connection from the Oder-Neisse path to the Berlin-Usedom cycling path. From the Oder-Neisse cycling path, cyclists can start a tour at many points into the protected area. The 211 kilometre-long path network in the Lower Oder Valley is designated as a cycle and footpath with a length of approx.. 162 kilometres. 30.8 kilometres of these paths lie in the wet polders and are therefore only accessible during the summer months. In winter, the wet polders are flooded as the Oder level rises. About half of the cycling route goes across the dykes in the Lower Oder Valley. The Crane Path, a 74-kilometre-long tour through the northern national park region, is part of the cycle paths that directly open up the Lower Oder Valley National Park and the National Park region. The Oder-Welse cycling path, which leads from Schwedt/Oder via Stützkow, Schöneberg, Felchow, Pinnow, Passow to Teerofen, opens up the middle part of the Lower Oder Valley and the adjacent region. It utilizes sections of the Crane Path and the Oder-Neisse circular routes. Cyclists on the “Stolper Tower” circular path can experience the southern part of the Lower Oder Valley National Park and the National Park region. This connects the towns of Stolpe, Gellmersdorf, Neukünkendorf, Herzsprung, Angermünde, Dobberzin and Crussow. Travellers arriving by train can start their tour in Angermünde. On the Polish side of the Oder, the “Green Oder” (Zielona Odra) cycling path opens up the Polish part of the Lower Oder Valley. At the border crossings in Schwedt and Mescherin, you have the possibility to switch to the cycle paths on the other side. The path, which, however, runs on heavily travelled roads, is connected with the network of buses and trains in Schwedt/Oder and Stetin (Szczecin). On the whole, the cycling path network on the German side of the Lower Oder Valley is widely branched and well developed. Its centrepiece, the Oder-Neisse cycling route, was rated with three stars by the ADFC as an “ADFC Quality Route” in 2009. It opens up many cross-connections that lead into the protected area. It offers cyclists so many possibilities to explore the Lower Oder Valley and experience the wilderness up close. It is also possible to cycle within the wilderness area on the marked paths.